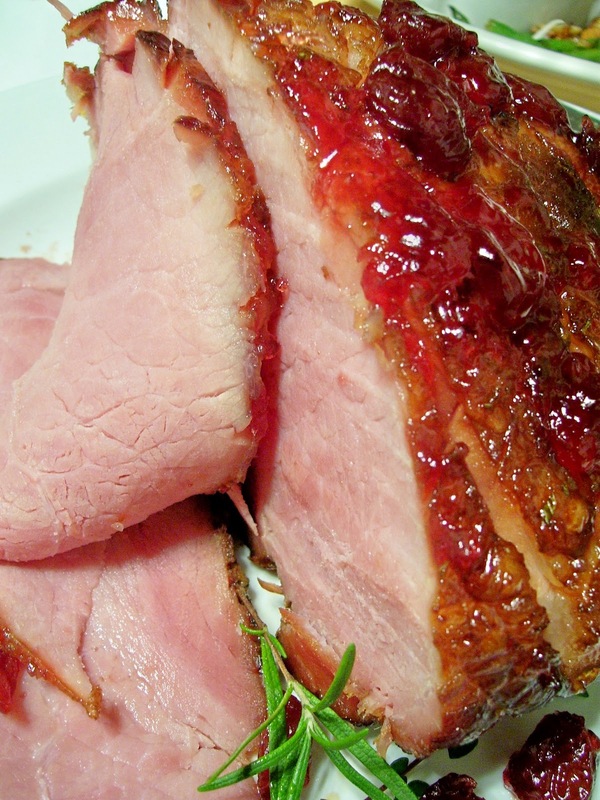 How to make a Christmas Ham? Just add bourbon. 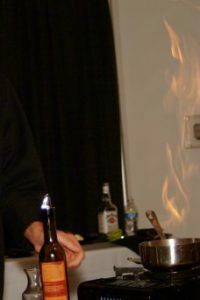 I taught the Culinary Arts Bourbon-Style Cooking School at the Kentucky Bourbon Festival for two years before eventually stepping down to let someone else take over. It was fun, but a lot work. The process took months of menu planning and recipe testing before actually taking our little traveling bourbon show on the road to My Old Kentucky Home State Park in Bardstown, Kentucky. Both years, I cooked five bourbon-filled courses for sold-out crowds of 230 people before demonstrating all the courses on stage while they ate them. Crazy. I had a blast doing it, but after planning, testing, tasting, and drinking hundreds of bourbon-infused recipes, I bottomed out on bourbon. To this day, I rarely drink or cook with bourbon…except for Christmas. Lately, I’ve tossed around ideas for something to cook for an upcoming family Christmas dinner we enjoy every year in a cabin overlooking the lake. It’s a potluck affair for a large group of people packed into a rented cabin anchored by a tiny kitchen with very limited storage…150 miles away. Tricky business. Think about it. 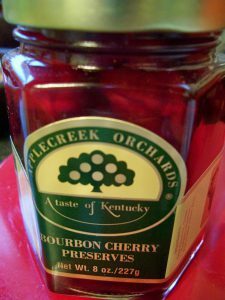 While rifling through our kitchen cabinets and pantry for potluck inspiration, I stumbled across a small jar of Kentucky Proud Applecreek Orchards Bourbon Cherry Preserves. So, I used it to slather a bourbon-soaked honey cured smoked ham. I fell off of the bourbon barrel. After scoring the outer layer of fat on a small three-pound honey cured smoked ham, I slowly brushed the split fat and exposed ham flesh with 1/2 cup of Maker’s Mark 46 bourbon. While the ham soaked up the potent 94 proof bourbon, I mixed together 1 cup of dark brown sugar, 1 tablespoon of ground mustard, 1/2 tablespoon of ground ginger, and a tablespoon of fresh minced rosemary. I rubbed the wet ham with the spiced brown sugar, wrapped it tightly in aluminum foil, placed it into a dutch oven with 1/2 cup of water, covered the pot, and slid it into a 350 degree oven to bake for an hour. 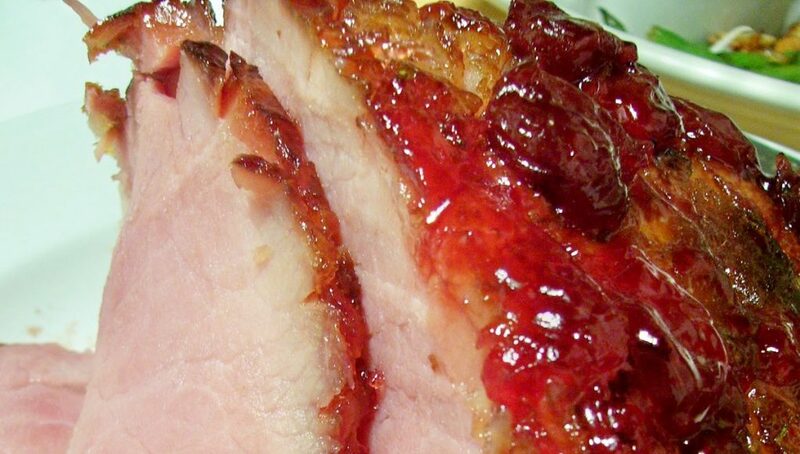 While the smoked ham simmered in its initial sugary bourbon bath, I threw together a finishing glaze using the Applecreek Orchards Bourbon Cherry Preserves. I melted 8 ounces of the preserves in a small saucepan over a medium flame before adding 1/4 cup red wine vinegar and 2 heaping teaspoons of prepared horseradish. I brought the glaze to a quick boil, reduced it to a simmer, and let it bubble away to thicken before setting it aside. After 45 minutes, I uncovered the ham, basted it with the gooey brown sugar rosemary-flecked Maker’s Mark 46 pan drippings, brushed it with the bourbon cherry glaze, and returned it to the oven (uncovered) for an additional 15 to 30 minutes to finish cooking. When the ham was beautifully glazed and caramelized, I pulled it from the oven, and let it rest, while we finish off the last of our Georges Duboeuf Beaujolaise Nouveau in the parlor. 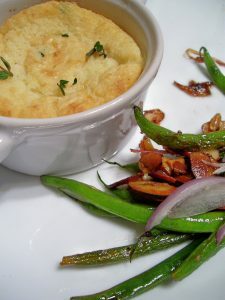 After slicing the glistening glazed ham, I served it on puddles of the sticky bourbon pan juices nestled alongside blistered Green Beans Amandine and individual pots of creamy Weisenberger Mill spoonbread. Old school. Without being cloyingly sweet, the succulent ham hinted a slight caramel flavor from the Maker’s 46-infused brown sugar sauna. 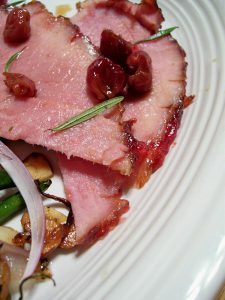 Peppered with hot pungent horseradish, the dreamy bourbon cherry preserves oozed over the salty smoked ham, creating a fabulous sweet and savory balance. Applecreek Orchards Bourbon Cherry Preserves. Not just for cocktails. 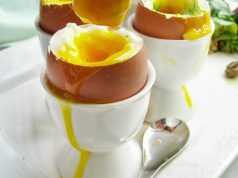 Not just for breakfast. Try it on pig. It’s Christmas. This article also appears on page 11 of the December 2018 printed edition of the Hamburg Journal. 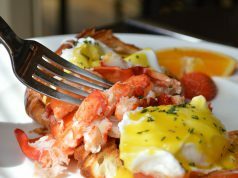 Previous articleWhen does Bravo’s Top Chef Kentucky premiere? 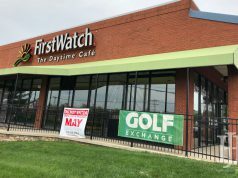 Next articleWhat’s Going on in Lexington for Pets?